Duplicati is a free and open source cloud backup software. It’s available for Linux, Windows, Mac and some NAS hardware. Duplicati for Linux supports various distributions such as Debian, Ubuntu, Fedora, CentOS and many others. There are many great backup software for Linux out there but most of them are not free. Cloudberry and Crashplan are some of the best cloud backup solution available for Linux. They offers some great services at some costs. But if you are looking for a free cloud backup solution for Linux, we highly recommend Duplicati. Even it’s free, it has many features you need for a cloud backup. 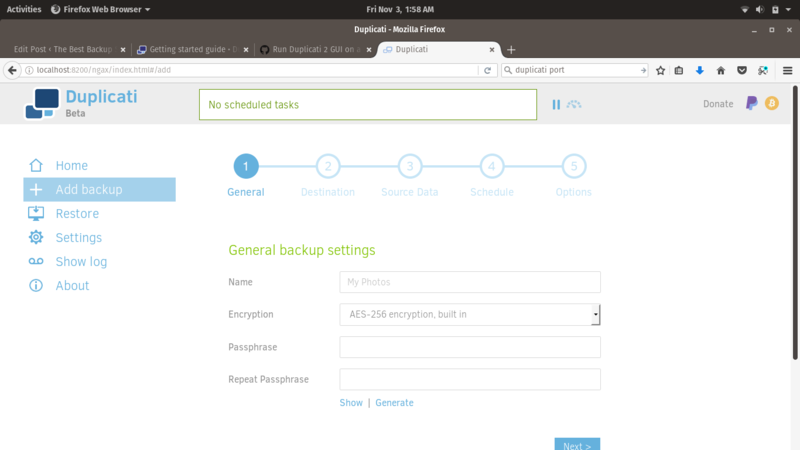 Duplicati is a free and open source cloud backup solution. It comes with a nice and simple web based UI. And the best part is that it supports various backend storage such as Amazon S3, Google Drive, Box.com, Mega and many more. You can also save your backup to local disk or network drive as well. It also has a built in encryption system that ensure your data transfer is secure. Duplicati comes with a nice web interface. You can manage your backup, configure the backup schedule and even restore files from your web browser. If you are running Ubuntu or Debian,please follow these steps to install Duplicati on Ubuntu and Debian. First, let’s download Duplicati DEB package. You can simply click the link below to download the latest version of Duplicati for Ubuntu. It will download some packages from the internet. Make sure you are connected to the internet before installing Duplicati. Please note by setting the interface to “any”, it means it will use any of your network interface. You can then connect it from anywhere in the network. Make sure your network is protected from outsider access. Duplicati for Linux is a great cloud backup solution for Linux. You can save your backup in various cloud storage backend. It uses web interface to manage the backup. Please stay tuned on this blog and we are going to write more article about how to use Duplicati to backup Linux desktop and server.